We're using a blog to collect suggestions to make the 2nd edition of Key Concepts in Geomorphology even better than the first. Visit the author's blog to contribute your ideas and feedback. Whether you're a current user or not yet familiar with the book, we want to hear from you. 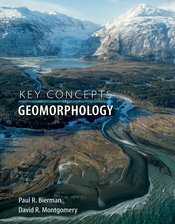 Written for introductory geomorphology courses, Key Concepts in Geomorphology offers an integrative, applications-centered approach to the study of the Earth’s dynamic surface. Bierman and Montgomery draw from the fields of physics, chemistry, biology, and mathematics to help students get a basic understanding of Earth surface processes and the evolution of topography over short and long timescales. The authors also hone in on practical applications, showing how scientists are using geomorphological research to tackle critical societal issues (natural disaster response, safer infrastructure, protecting species, and more).